My 15 minutes of stalking didn't yield anything, but I made the first steps into infiltrating the cast and crew. I can't reveal my methods, obviously, but they rely heavily on my natural charm, which was hampered by my inability to talk because of an insanely sore throat. I need to get better, fast, if I hope to watch any filming or spot any stars. 1. The base camp is NOT where the filming is happening. In fact, I couldn't seem to locate the set. 2. You need to dress properly to stalk a movie. You are NOT going to fit in in a patterned shirt or skirt. You need to wear JEANS and a dark shirt, and have your cell phone out a lot, or hooked to your belt. 3. Start with the older guys. They'll be the most helpful to you. Wait- am I revealing too much? I better go before I ruin my cover. 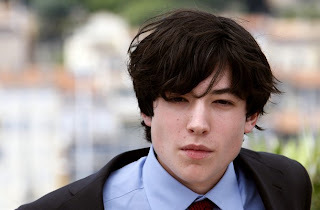 Also, to facilitate my recon, I learned that this kid Ezra Miller, in photo above, is one of the stars. It's very important to know faces if you expect to follow the clues that eventually lead you to get to watch, oh, say, DeNiro film a scene in Stamford. The base camp is at Wright Tech- what an ugly building!- and the set is- well, I have no idea. Last night I dreamt I saw Tilda Swinton driving back to the set in the same little blue car I saw her and John C. Reilly in on Tuesday. Although this time, it was a bright blue Mini rather than a steel blue Subaru Outback.